Obtaining feedback to make smarter career decisions is easier than ever. There is a diverse assortment of options for getting career navigation feedback . In an earlier post we reviewed 8 Sources of Feedback to Help Your Career Flourish. There are times when I’m just plain stuck and need a little feedback to take a next step. Like the time I was researching the best title for my book. For choosing the right job, selecting the best hosting provider, or vetting an idea. Maybe you are trying to solve a complicated puzzle and you don’t know what to do next. You have more questions than answers. It’s past midnight, and you wonder if anyone out there knows something you don’t. This isn’t like the guy code of not asking for directions (ladies, you know what I am talking about) when you are lost. This is your life! While there are many different ways to seek guidance and advice, there is one trend driving equal opportunity access and sharing for all: crowdsource feedback. Sharing ideas, discussing problems, and posting questions to larger groups of people results in creative solutions and innovative ideas. I used to feel alone in my work life without a formal mentor. Although I reached out to situational mentors, there was no one in particular that I could call upon for guidance. Yet, realizing I was not alone, I discovered new ways to tap into practical advice. Crowdsource feedback system is self-directed, helping you move forward with intention and informed decisions. Asking questions is a valuable tactic for developing your workplace opportunity toolkit. Because of this, you will be noticed, and this habit will lead to thoughtful insights and happy times ahead. When seeking advice, start with open-ended questions. Think like a reporter. Ask who, what, where, when, how, or why questions to get to reasons behind answers or to capture context. Only use a yes/no or multiple choice questions when taking a poll. For example, you can set up a question where you choose between three different locations or job descriptions. Fortunately, there are no-cost or low-cost online feedback options. 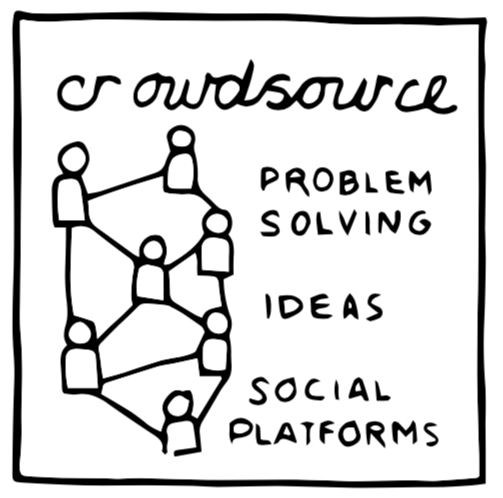 The crowdsource movement has inspired numerous user-generated social platforms for asking and answering questions. As a result, the curious effect of the crowd is people genuinely want to help each other. There is an impressive variety of input for individuals making decisions for their careers or their businesses. Consider Facebook, LinkedIn, Quora, Slack channels, and MetaFilter. You can ask questions and interact with professionals regarding career and entrepreneur topics. Here is how some employees and entrepreneurs are using these channels to make better career decisions. Many thought leaders build their communities by answering questions related to their area of expertise. You can engage with a global conglomeration of peers, entrepreneurs, coaches, and a diverse group of subject matter experts. With large online communities, you will likely receive a number of relevant responses. Let’s review two of these online channels. As an entrepreneur, I often look for guidance and advice from thought leaders who publish online content, offer training, or manage Facebook groups. Chris Brogan, CEO of Owner Media Group, provides skill training for the modern entrepreneur. His community includes careerists, solopreneurs, freelancers, micro-businesses, and small businesses. One of Chris’s many productive outlets for free content sharing is a user-driven private Facebook group. With close to fifteen thousand business-focused members, questions receive several useful responses. For example, there was a dialogue about a job seeker’s interviewing process. The responders deliberated on the appropriate number of callback interviews and provided context for when the number seemed excessive. The discussion addressed a trend by some employers asking a job candidate to create a program plan to demonstrate their value in the role. Group members expressed concern potential employers might be using this process for idea generation, especially if five or six candidates were delivering the same project. Private Facebook groups are a consistent resource to gauge feedback on various subjects. I recently queried a couple Facebook groups to get feedback on the most effective messages for my new website. The value gained was significant because several members asked deeper questions about my business. As a result, the feedback helped clarify my position and enabled me to make content adjustments. The back and forth process within groups will not replace a coaching relationship, but it may help you better understand your audience. Plus, you can post content and receive comments on your schedule. Additional data points are a tremendous support for moving your project or career forward. Quora is a question and answer site. Many of the subject matter experts I admire are active on the platform. Their one-on-one coaching may not be available as a business offering, yet you can learn from them through monitoring their answers. If you are lucky, one of them will answer your question! What are the most desirable programming languages for getting hired? Is 30 too old for a career change? How can I find my hidden talents? How do I change my career without losing everything? Quora is an effective outlet to research and gain general-purpose feedback from the crowd. Without word count limits, the exchanges feel and look like conversations. When making important career decisions, there are numerous ways to seek advice and guidance. Crowdsourcing your questions complements your career management and job search strategies. You will also benefit from joining a mastermind group, hiring a coach, or working one-on-one with a mentor. The idea and feedback exchanges are a distinct advantage for global workers. People at the center of sharing networks, rather than the perimeters of isolation, will advance their careers.